I live in an old, old house. I love it, but things break. A couple of weeks ago, the lock on the front door stopped working. And it was a teeny bit of a problem. When I went to bed, the lock worked. Not great, a little sticky, but ok. When I got up the next morning, I couldn't get the door open. (or climb out the dining room window). And so I called a locksmith. He came the next afternoon when the boys were home. My son called to tell me the locksmith said the lock was worn out and needed to be replaced. I paid him over the phone. I had class that night and didn't get home until much later than usual, after 8.
in about ten assorted pieces. I meant to throw it out. But I didn't do it that night. The next night when I came home, the lock was still on the table. Son #1 is a kinesthetic learner. He loves, loves, loves to put things together. He struggled and struggled and struggled through school. Partially proficient on every standardized test he ever took. Right now he is working in the fuel department of a grocery store. outside of a grocery store and takes your money. It's not a great job. And every night I worry that he will get shot. Or killed by a drunk driver on the way home. But at least he is doing something. He goes to work every day. He pays his car payment and insurance and phone. I wonder what he would be doing right now. Don Graves used to always say that poets and scientists have a lot in common, because they both have to observe the world very closely. I thought about that comment this week, as I was putting together my list of #Nonfiction 10 for 10. Most Fridays, I participate in Poetry Friday. 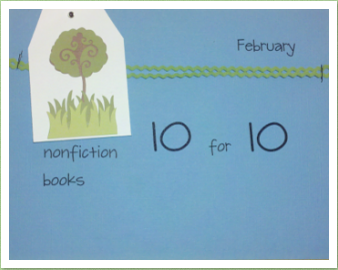 Today, however, I also wanted to participate in the Nonfiction Picture Book 10 for 10. I decided to combine the two, and put together a list of books that combine nonfiction and poetry. For this week's Poetry Friday, go to Donna Smith's Mainely Write. I know most people know Joy Sidman's work, but in my mind, she's the queen of nonfiction poetry, and I couldn't put together a list without including at least one of hers! 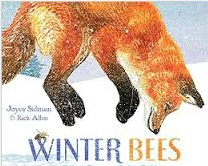 WINTER BEES, about how animals survive the harshest of seasons, is her latest. I reviewed it here. 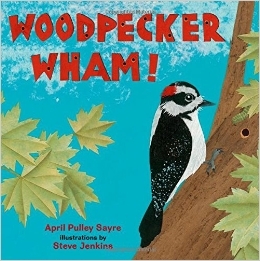 End notes include six pages packed with facts about woodpeckers, for instance, I'll bet you didn't know. did you know that the woodpeckers's nostrils are covered by feather tufts that keep out wood flakes as they dig. 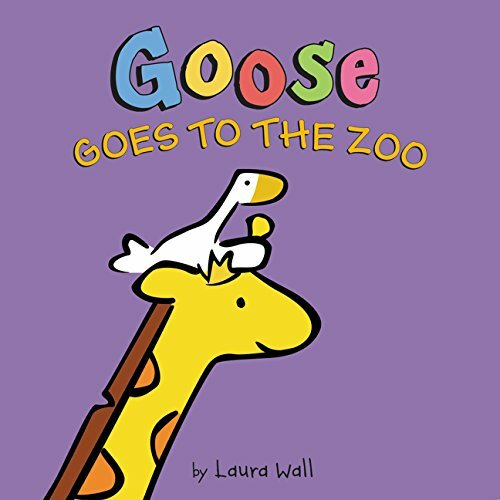 End pages include a paragraph about each animal. I love Irene Latham's DEAR WANDERING WILDEBEEST, which was a CYBILS finalist last year. 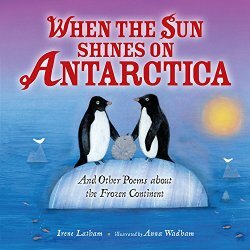 Irene has a new book, with poems from Antarctica. I work at a dual language school. 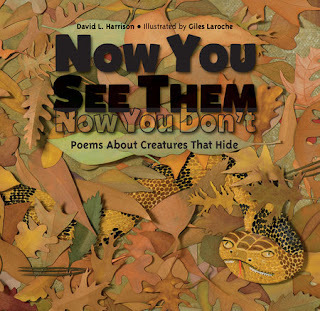 I can't put together a poetry collection, then without including at least one bilingual book. 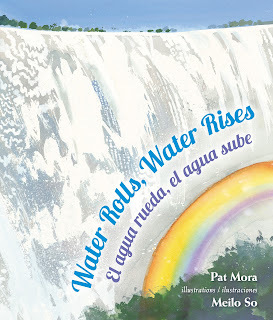 I love Pat Mora's book about water around the world. Mora's poetry is accompanied by artwork by Meilo So (PALE MALE, WATER SINGS BLUE). End pages include not only a bilingual author's note, but also references to what part of the world served as the inspiration for the art. Now that I'm a grandmother, I've developed a new interest in board books. THIS LITTLE PRESIDENT presents a short riddle/poem about approximately ten different presidents, including George Washington, Abraham Lincoln, Theodore Roosevelt, and of course, Barack Obama . The facing page is a fact about that president. The facts are basic, but really appropriate for the book-eating set, e.g. Barack Obama is the first African American president of the United States. 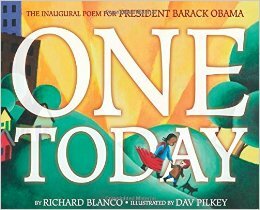 Barack Obama's inauguration speech, illustrated by none other than Dav Pilkey, yes, he of Captain Underpants fame! I'll be using this one with our middle schoolers this year! Fields to plow, and rows to seed. Five more days to Congo Square. 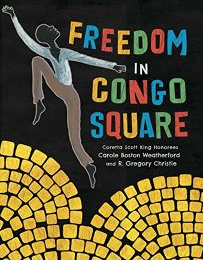 Finally, Sunday afternoon came, and they slaves, met at Congo Square and share song and dance and art and stories. This piece of earth was a world apart. End pages include an author’s note and a glossary. This picture book biography tells the story of George Moses Horton, a North Carolina slave who taught himself to read and eventually became the South's first African American published poet. The author's note, where Don Tate talks about his experiences growing up as the only brown face in a sea of white, would make a great discussion in and of itself. Because you didn’t go to school. I coach several young teachers, with little babies. Many mornings, they come to school, hair knotted on top of head, dark circles under their eyes. They tell stories of midnight feedings, teething, ear aches. They long for the days ahead, when they will once again be allowed to sleep through the night. And I wish I could tell them that this is true. That mothers eventually do sleep through the night. That my sons, who are 20 and 22, let me sleep through the night every night. But that doesn't seem to always be the case. Take last night for instance. A few days ago, my son told me that they were changing his hours at his job. For the past few months, he's worked 1:00-9:30. He's not a morning person, so that works well for him. He sleeps, I think, until about ten. Plays a few video games. Eats something and goes to work at 1. And the schedule kind of works for me. I am not a night person, but I can make myself stay up until ten, so I can see him. Touch base. Answer random questions about car insurance and W-2's. Be there if he wants to talk (he usually doesn't). The new schedule, 3:45 until closing, sometime around 12:30, doesn't work for me at all. I don't get home, ever, before he leaves for work at 3:15. And I definitely can't stay up until 12:30, then get up and go to work the next morning. I wonder if I will ever see him. How we will make time to talk. How I will know if he is ok.
At first, he tells me the schedule will start in a week or two. Then on Sunday he texts me while I am visiting my mom. The new schedule starts today, he says. Immediately, I start to worry. I imagine him being jumped as he walks across the dark parking lot with a bag of money from the gas stand. I imagine him being killed by a drunk driver on the way home. Or being pulled over by the police to become yet another young African American male statistic on his way home. I am terrified. Several times that evening I text to check in. He becomes irritated. Tells me he is making money and I need to leave him alone. I apologize. I go to bed. Drift into that light mother of adolescents sleep mode, where you are kind of half, but know your babies are yet not home safe. The dog doesn't not come to bed with me. She is also waiting for her boy to come home. At 12:38, my phone rings. My son's number shows up on the screen and I immediately panic. Fortunately, it's nothing major. A co-worker is having car trouble. Zay is following the worker home to make sure he gets there. I ask where the co worker lives. Zay doesn't know, but says he will be home after that. I'm grateful (and a little surprised) that he has called to let me know. I wonder if these midnight calls will become a regular occurrence. Evidently, the co-worker lives close by, because at 12:53 the front door opens. I hear the dog jump off the couch to greet him. Hear Zay's heavy work boot tread on the kitchen floor above me. Hear him open the refrigerator. Pause at the top of the stairs. "Can I have that box in the fridge?" he says, referring to the leftover fajitas I brought home from lunch with my mom, thinking I would take them to school for lunch on Tuesday. I tell him he can. He clunks around the kitchen for a few more minutes, then I hear the microwave ping. A few minutes later, his door shuts, and the house is quiet. I go back to sleep. At 2:40, the dog begins to whine. She wants to go outside. This isn't typical for her, and I wonder if she is sick. I lay awake for a few minutes, contemplating where the money for a vet bill might come from. At 4:00 the alarm goes off. I have the day off, but have a ton of papers to read and grade and have not been very productive this weekend. I groan and roll over. Motherhood, with its sleepless nights, doesn't end when children are two or three or four. I am pretty sure those go on forever. Sophie and Goose are best friends. Sophie is worried that Goose might be lonely while Sophie is at school, so she takes her to the zoo to find a new friend. The giraffe is nice and friendly, but he can't fly. The smiling crocodile likes the wrong kind of goose food! The flamingos don't do much. Finally, Sophie and Goose find the perfect friends- a flock of geese. Goose likes them a lot, but of course, they are not as special as his best friend, Sophie! A sweet addition to the GOOSE series, the little guys are going to love this one! A couple of weeks ago, Mary Lee told me about Laura Shovan's found poem project. I wanted to participate. I really did. I even went so far as to paste the first two pictures, one of an old box, and one of vegetables, into blog posts. But somehow it just hasn't happened. Life is just a teeny bit much right now and I haven't been writing. At all. Hardly even blog posts. 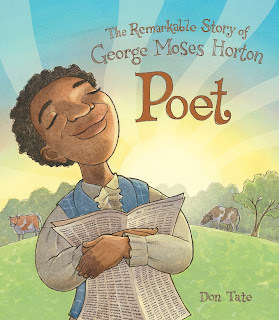 I decided, then, that I would feature African American poets on my blog this month. 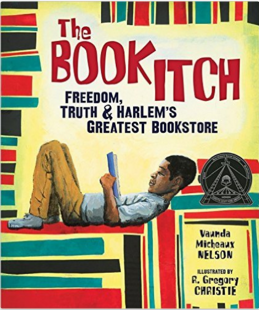 Last week, I had Langston Hughes. 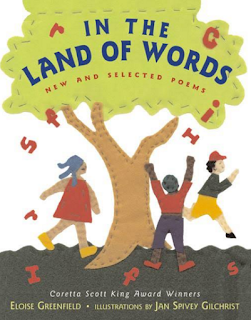 Today's offering is from Eloise Greenfield's book, IN THE LAND OF WORDS, first published in 2003. The book is divided into two sections. The first half of the book, THE POET/THE POEM features poems about Greenfield's family, past, and experiences. Each poem is accompanied by a brief explanation of its history. The second half of the book, IN THE LAND, features poems about books, and words, and other literacy-related topics. Poet: But suppose I get lost? Review copy of book provided by publisher. Poetry Friday today is hosted by Kimberly Moran. Kimberly is featuring Kristine O'Connell George's book, HUMMINGBIRD NEST. A friend just gave me a beautiful new journal and I really want to try some nature journaling. 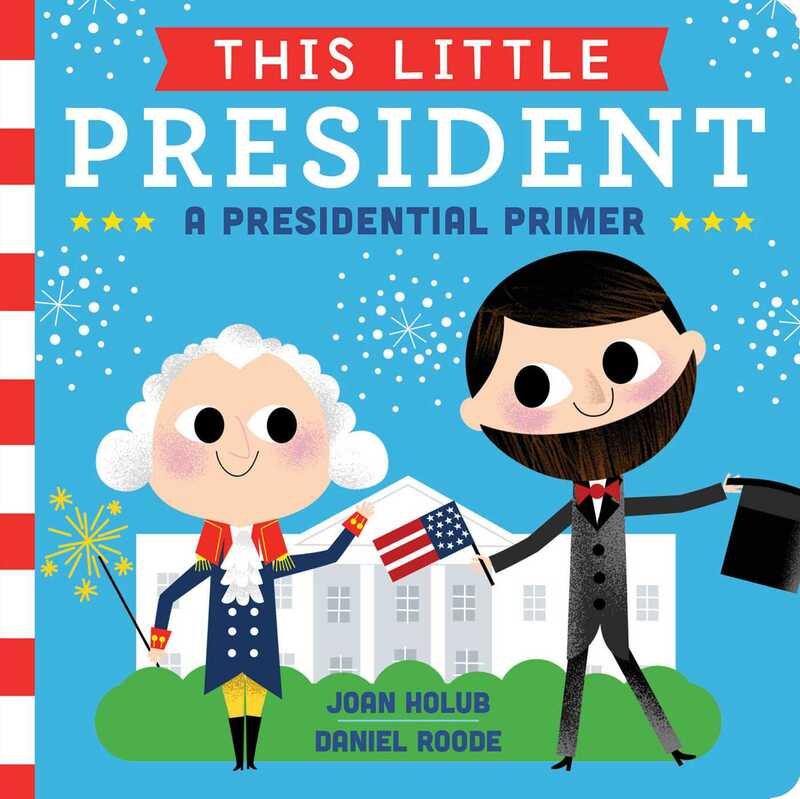 This book seems like it would a good mentor text. Happy reading! Happy writing! Happy poetry! I've spent my entire career in urban settings. The school where I work now is 98% Hispanic. More than half of my students spoke Spanish before they spoke English. Our free lunch rate hovers right around 90%. My students' parents work two jobs. and serve your meals in restaurants. And I have these two big guys living at my house. even though he never had one of his own. supposedly "college and career ready"
the people who are supposed to keep them safe. "Let America be America Again,"
And it seemed worth sharing. the other read by Nikki Giovanni. so I'm including the whole thing. Here is a slightly different version of the poem, published as an essay. Tricia, at the Miss Rumphius Effect, is hosting Poetry Friday today. I'm gonna admit it up front. I just don't quite have the hang of it. Last week, for example, I became a grandmother. Actually, I officially became a grandmother on November 30, 2014. But I didn't meet my granddaughter, Esveidy, until last weekend. Maybe I should back up just a little. In Spring, 2014, my son, who was 18, called from college in Arizona to tell me that his girlfriend, who I had never met, might be pregnant. We had, as I remember, one of those "typical" sounds like you just made your life a whole lot harder conversations. And then a few weeks later, there was another conversation. There was a really confusing phone call from the girl, who I still hadn't met, that summer. And then in November, there was a baby. But my son's name was allegedly not on the birth certificate. The mother didn't want anything to do with him. And then this summer he was going to go down to Arizona. And then in December, he asked if I would buy a plane ticket. I did, as an early birthday present. On Christmas Day, he flew down to meet his daughter. This is the first picture I received. He stayed two weeks, then came home. At one point, the plan had been that he would get a job and resume his education at Denver Community College, with hopes of attending another college that had a basketball team next fall. But then he decided he didn't want to do that. 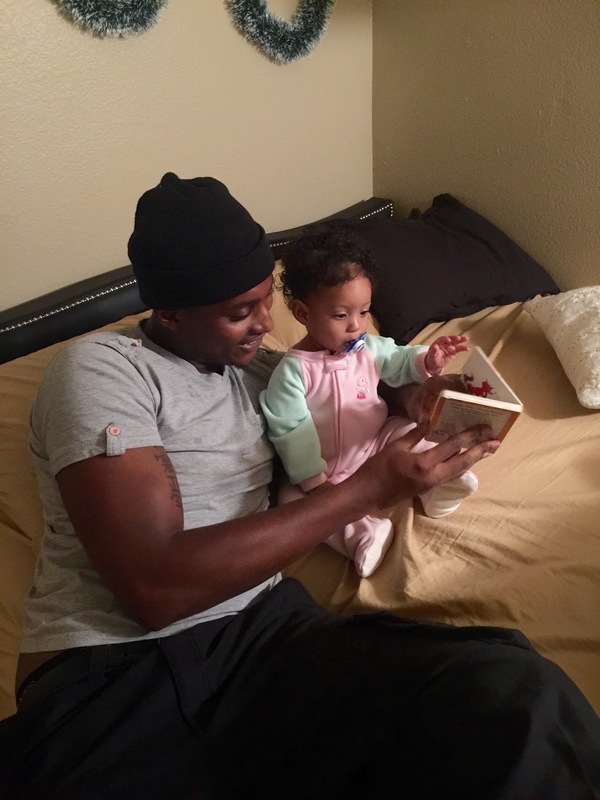 Instead, he wanted to go back to Arizona to be closer to his girlfriend and baby. So last week we got the car tuned up. On Saturday morning, he and I got in the car, and drove the 13 hours to Phoenix. On Sunday, we went grocery shopping, then went back to the apartment, so I could meet C and Esveidy. And of course, I am totally smitten with the world's cutest little punkin, and ready to pick up and move down there immediately. I have to admit, I'm more than a little worried. My son doesn't have any idea what he wants to be when he "grows up." He only has about a year of college. He doesn't have a job yet, has never done anything more significant than flipping burgers and making doughnuts. And maybe more importantly, he's never had a dad. He doesn't know how dads are supposed to behave, not even the simple stuff like how to put the baby in the car seat, let alone how to support a daughter emotionally. And although he has had at least one long term girlfriend and lots of shorter ones, I'm not sure he knows much about relationships, at least not healthy ones. But he's trying. And so a new chapter in life begins. I sure wish there was a book I could read.